Among Bart Topping’s fondest childhood memories of the ranch he grew up on are those of working alongside his father and grandfather. “When there was work to be done, there was always family there to do it.” The 2,000-acre ranch adjoining the San Joaquin River continues to be a family operation. With a mitigation bank and a conservation easement on large portions of the property, it will be conserved for perpetuity as a working landscape. Wildflowers blanket the hills at Topping Ranch.Photo by Thelma Valdez. Topping’s herd of 350 mother cows and their calves are raised for natural beef, free of antibiotics and growth hormones. The cattle graze on the ranch from mid-September to late spring, when Topping takes them to graze in the High Sierra for the summer. This protects the ranch land by crating a natural rotation cycle. Among the property’s notable features are its rich wetlands areas. 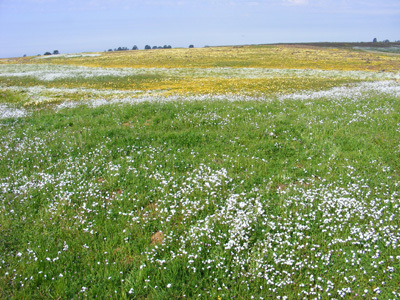 In the spring, a rainbow of wildflowers comes to life, nourished by the vernal pools that fill with water and then disappear as the weather heats up. More than 200 animal and plant species live in the pools, including the vernal pool fairy shrimp, a threatened species under the federal Endangered Species Act. Thirty-two other plant and animal species are also under federal protection. It was those early memories of working the ranch and “the freedom to be outside and go for miles in the quiet open space” that led Topping to decide to conserve the land. After setting up a mitigation bank through the U.S. Fish and Wildlife Service on the 40 percent of Kennedy Table that lies on his property, Topping decided to investigate setting up a conservation easement on another portion of the ranch. He heard about the Sierra Foothill Conservancy (SFC) and, clearly one who does his research, Topping asked to be on the board so he could find out what land trusts are about. For those who pass by in years to come, this working landscape will tell the story of the family ranch and all that it embodies: freedom and open space, family values, the benefits of hard work, and the rewards of living in harmony with nature.